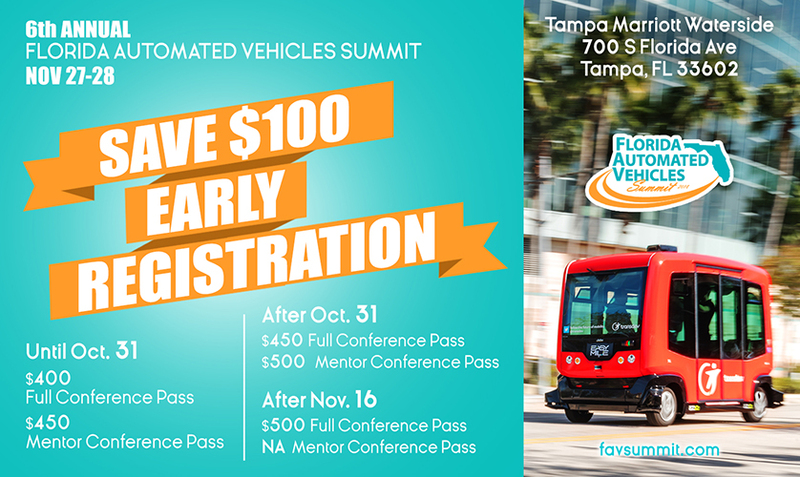 The Florida Automated Vehicles (FAV) Summit assembles industry leaders from around the world to address technologies, operations, and policy issues. Their mission is to gain insight into what Florida is doing to create the ideal climate for the implementation and deployment of autonomous and connected vehicle technologies. SAE International is pleased to be a Platinum Sponsor, as well as the sponsor of the Tuesday Networking Lunch Reception, for the 6th Annual Florida Automated Vehicles Summit. Ed Straub, Manager SAE Office of Automation, will be a panelist in the Session “National Perspectives: ACES Activities” taking place on Wednesday, November 28th, 10:30 AM - Noon. Be sure to register early, by October 31, 2018, in order to save $100 on your Full Conference or Mentor conference pass!